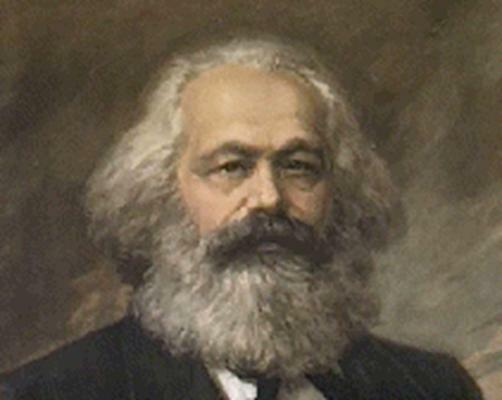 Despite the massive amount of writings that Karl Marx left behind, he is often misquoted and misconstrued–not only by his ideological objectors, but his own followers, as well. It is not uncommon for Marx to be included on many people’s shortlist of their most despised ideologues. On the other hand, it is not uncommon for Marx to be included on many people’s shortlist of influential thinkers. Marx is often falsely accused of promoting a future utopia, a charge that he is easily acquitted of once one reads Marx’s own words. 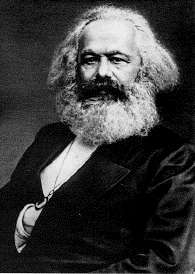 What made Marx such a polarizing figure? This is a very difficult question for anyone to answer. His critical theory included countless charges raised against the system of Capitalism. The polarity associated with Marx’s writings can be attributed to the nuance of his theory. Marx explored the gray area of Capitalism and labor. It would be inaccurate to say that Marx personally wanted to eliminate Capitalism. It would be just as inaccurate to say that Marx championed Capitalism. Neither of these previous statements are any more accurate than the other. Marx offered a brutal critique of Capitalism, yet he often insisted that it would bring about its own demise. The brilliance of Marx is the nuance in his writings; concrete criticisms mixed with abstract metaphors that incites a reader to either passionately defend capitalism or cheer its inevitable demise. Marx was no utopian prophet–his analysis of possible future socioeconomic possibilities were merely tools to serve as a catalyst in the interpretation of his work; not a clearly defined vision of what was to come. Marx used material facts of human life in his criticism of capitalism. He applied reason to these material facts in the hope that, by educating the worker masses of the true nature of their condition, his theory would help them better position themselves once the inevitable fall of capitalism occurred. His rhetoric in The Manifesto of the Communist Party was enriched by metaphors that offered the reader a new perspective on capitalism. This allows the reader to reach their own conclusions once they interpret the connection, instead of Marx merely boring them to death with one scholarly example after the other of why capitalism is not what we are led to believe by the bourgeois. This was not a work for his academic peers, quite the contrary, it was a work for the victims of capitalism. His knack for connecting the abstract with materialism through the use of metaphor allowed Marx to present his complex ideas in a way that is engaging and understandable to the reader. A prime example would be the opening line of Manifesto of the Communist Party: “A spectre is haunting Europe—the spectre of Communism” (473). In just one opening sentence, Marx breaks down the fear of Communism to merely a “nursery tale” (Marx, Engels, and Tucker 473). But the controversy surrounding Marx was not just Communism, but also his harsh criticisms of the current system: Capitalism. Marx approached the critique of Capitalism from two basic angles: 1) It is flawed and the nature of these flaws will bring about its own demise 2) Much like the past, when one socioeconomic dynamic gives way, another approaches. Marx felt that socialism was a likely successor and the most beneficial to the proletariat. However, he did not see Socialism, and eventually Communism, as the future pinnacle of human existence. Nor were these possible socioeconomic systems the culmination of the proletariat struggle. He offered them as just that: possibilities. Marx’s vision of a future socioeconomic dynamic can be seen as being grounded on dialectical reasoning, borrowed from Hegel with some modification. A primitive example is that Capitalism is the thesis, Socialism is the anti-thesis, and Communism would be the synthesis (or abstract, negative, concrete, respectively, if one prefers). Of course, this is a simplification. But the point is that each of these socioeconomic systems will reach a maximum efficiency and then bring about its own decline. It is important to note that his view on the socioeconomic direction of human existence is grounded on logic and reasoning; as opposed to personal gain or validation of any doctrine he carries with him. Marx, nor Engles, had anything to gain substantially if Communism came about. They were not sitting around with a bottle of Champagne waiting to celebrate the fall of the bourgeois. They saw an injustice in the world and they did their best to define it for those who were suffering from it. 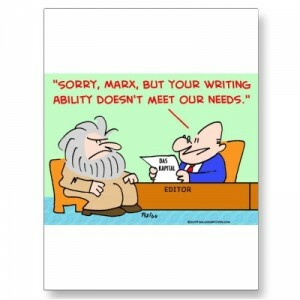 The only way one could reach the conclusion that Marx’s intentions were selfish would be to misinterpret his works. So who stands to gain by the fall of Capitalism and the rise of the proletariat? The proletariat does socially, politically, and economically. Marx often reminded his reader that he was not a philosopher, nor was he offering a dogma for the proletariat to follow. Marx knew that the the system of Capitalism was not sustainable indefinitely, as its most staunch supporters often insisted. The laborers who sell their work to the bourgeoisie would eventually demand a change as capital becomes more concentrated into the hands of the few and this would become more evident to the worker class as their political power slowly deteriorates in the meantime. Marx knew that they could only be pushed so far and that a tipping point was soon in the horizon. He saw societies in which workers were alienated from the products they produced. The more those who owned the means of production continued to amass capital, the more the working class suffered and struggled. Marx stated that “Accumulation of wealth at one pole is, therefore, at the same time accumulation of misery, agony of toil, slavery, ignorance, brutality, mental degradation, at the opposite pole…” (431) This system of private property and wealth concentrated in the hands of the few perpetuates the existence of the proletariat and vice versa. Victory for the proletariat would not only mean abolishing private property, but would also mean the demise of the proletariat itself (134). Once again, the rise of the proletariat is only the beginning. So does Marx need to provide an alternative to capitalism in order for his criticisms to be justified and validated? Of course not. In fact, he often scoffed at and ridiculed past references to any future utopia. These are seen as a distraction to Marx by focusing attention away from class struggles and only continuing to perpetuate them. Marx offered no Utopia to his readers. Communism was not presented as the way it should be, but rather Communism was the way it was likely going to be as each socioeconomic system gives way to another by improving upon itself. In addition to envisioning a utopian future, Marx is often misconstrued to have promoted the abolition of all private property without prejudice. This is contrary to Marx’s actual words: “The distinguishing feature of Communism is not the abolition of property generally, but the abolition of bourgeois property” (484). For Marx, bourgeois private property was the epitome of the class struggle that is “based on class antagonisms, on the exploitation of the many by the few” (484). 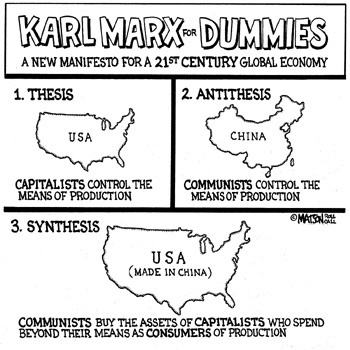 Note that Marx did not say: ‘Hey, let’s get rid of private property and we will all live happily ever after’. This would be an overly simplified and flawed interpretation. He merely points out that classes are the product of private property, and vice versa. Additionally, Marx points out that property is the consequence of alienated labor (79). Therefore, the abolition of one would mean the abolition of the other. Marx’s nuanced view on private property can be easily misconstrued by his critics and objectors. Its destruction was not some normative view Marx carried with him. Its destruction was already happening in society because its execution was to be carried out by itself, not by some self-proclaimed prophet or any other single individual. No matter how one feels about Communism, or its alleged inevitability, it is difficult to ignore the fact that Marx’s criticisms of Capitalism were abound in his works. Marx’s criticisms of Capitalism often placed him in a light that showed him pitting himself against it. In fact, Marx often showed appreciation for Capitalism and the bourgeois: “The bourgeoisie, during its rule of scarce one hundred years, has created more massive and more colossal productive forces than have all preceding generations together” (477). These are the words of someone who appreciates the contribution of Capitalism to human civilization, yet from someone who still feels that its expiration date is soon to come. York, NY: W. W. Norton & Company, Inc., 1978. Print.